I would like to start this essay by claiming and owning the fact that I have mixed a couple of metaphors within but try to stick with me as I mosey towards the point – which you may have heard before but bears repeating. 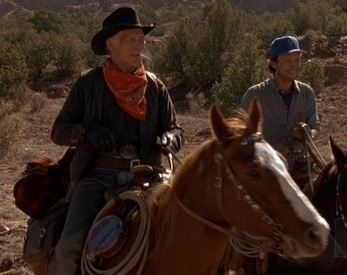 City Slickers was a popular 1991 movie that starred frequent Oscars host Billy Crystal and the late Jack Palance. If you remember the movie, you’re probably feeling as old as I felt when I first recalled it. There’s a memorable scene in the movie when Billy Crystal’s character, Mitch, is alone with Curly, the surly, plain-talking cowboy played by Palance, who teaches Mitch about cattle herding and life. (Cowboys, we speculate, generally know something about branding). More than ever, nonprofits need to do what Mitch did and take Curly’s advice. Over the course of my career, I’ve worked at six nonprofits. None of them were clear on what their one thing was. They were tossed on the waves like beach balls. What we need in the nonprofit world are more lighthouses. Even if your nonprofit is far from the ocean, I bet you’ve seen one of these lighthouses. Pick one or two nonprofits you admire. They’re most likely straddling some dangerous strait and directing their light on saving and protecting lives, easing suffering or delivering people from ignorance. They’re focused on one thing and they do it well. Damn the rest. The Ellie Fund, a small nonprofit in my hometown of Boston, is focusing its light on the challenges women face living with breast cancer. They support them with transportation to medical appointments, childcare, housekeeping, groceries and meals. The organization’s executive director, Julie Nations, knows her one thing and is mustering all her power to light the way for these women. The Ellie Fund isn’t finding a cure for cancer. They don’t give treatment advice. They don’t help men or children, at least not directly. They only do one thing: they ease the difficult impact breast cancer has on a woman. They know what they have to do every day, and they’re branding is simple and powerful. They don’t need an ad agency to tell them who they are. If only most nonprofits were as compelling, focused and illuminating. Stop diffusing your light by focusing on too many things. Affix yourself to one hazard and be the beacon that saves someone from a terrible wreck. That’s what nonprofit success is really about. Back to the plains, now. Shortly after Curly shared his deep “one thing” advice, he died in his sleep (as another character pointed out, Curly did eat bacon every day). But being focused on one thing had served him well, as it did the character of Mitch when he finally grasped the meaning. So what’s your nonprofit’s one thing? It’s time you figured it out. Joe Waters blogs at Selfishgiving.com. He’s the co-author of Cause Marketing for Dummies.